Good news in Kickstarter Update 61: if you own a copy of Wasteland 2 on Windows, Mac or Linux, we will upgrade it to the Game of the Year Edition on those platforms! We’re very happy to announce that the Game of the Year Edition will be coming as a FREE UPDATE to all owners of Wasteland 2 on Windows, Mac or Linux. Whether an original backer, a late backer or someone who purchased the game later on, we will be providing Wasteland 2 Game of the Year Edition as an upgrade to your PC version of the game, available to you when it launches in late summer of this year! Damn those graphics. 8/10 would bang. Can't show my appreciation enough for all the post release work. Edit: I think what i was trying to say was, that the visual design in wl2 was already good under unity 4 and after the switch of shaders the assets needed some love to bring back that design. And i'm seeing it again now. this must have been a lot of work i imagine. It was worth it. Thanks. Also: The quirks and perks and precision strikes teasers are awesome, too. Certainly something i'm looking forward to. Tnx for this inxile! You and HBS are the best! I'll be sure to support your BT4 KS. Sounds pretty promising so far. I'm still a bit leery about some of the new mechanics, but the small amount that's been revealed thus far does sound promising - and those screen shots are, of course, a pretty significant improvement over the vanilla release version. 80 Perks and 20 Quirks sounds like a good amount, though it really depends on exactly how many Perks and Quirks a character can expect to accrue throughout the game. With up to seven characters in your squad at a time some overlap is inevitable, especially if we're getting a Perk every level or two. Of course, the "Late Summer" release date leaves a bit to be desired. It sounds like I won't actually end up playing Wasteland 2 again until somewhere around August or September. Last edited by SagaDC on May 7th, 2015, 12:34 pm, edited 2 times in total. Great! Those visual improvements are striking. I can't wait to see more. The update looks great. I haven't been following the developments for a while. What is the status of the DRM-free disks? Excuse me while I PAINT THE WALLS WITH MY MIND. Can you please, please add more NPC avatars in the game, that actually match with the textual describes of those charachters. It's is killing immersion so much, when you see that the same avatar is being used for a dozen of NPCs you are talking in the game, and especially when that avatar don't match at all with textual describe of the NPC at the start of conversation. Is it just me, or are the screenshots a bit too saturated? Its WIP, just a little concern i had. Original W2 is colorfull aswell, but because there was less flora and detail in the scenes, it helped make it more rich. Now that it seems like theres much more detail and contrast in the scenes, at first glance i would say the saturation could be toned down without making the game look bland, a little bit more gritty, and less cartoonish. IMO. I don't agree. The screenshot shown may benefit from a reduction of the light intensity on the left and/or reduction of the reflectance of the shown fence (shouldn't that be illuminated from the back anyway?). But otherwise i think it was and is a nice change of style, that wl2 went with a green wasteland (see also all title banners and concept art, also i bet the screenshot shows california). Your shopped shot looks like any other generic gritty post apoc rpg. I agree though, that we were shown a great deal of green. But rather than drop all saturation, i think it is better to take great care where we will see green flora, and add some non green one for other regions. P.s. Personally i think screenshot 2 is the best. Nice colors and atmosphere. The only small addition i could see would be some slight (maybe fake) ambient occlusion (in the form of vertex coloring) on the broken wall segment, to make it blend in better with the ground. Incidentally, it's a low sun shot, that is less prone to oversaturation/too bright light intensities. Agreed, it definitely feels too colorful to me. 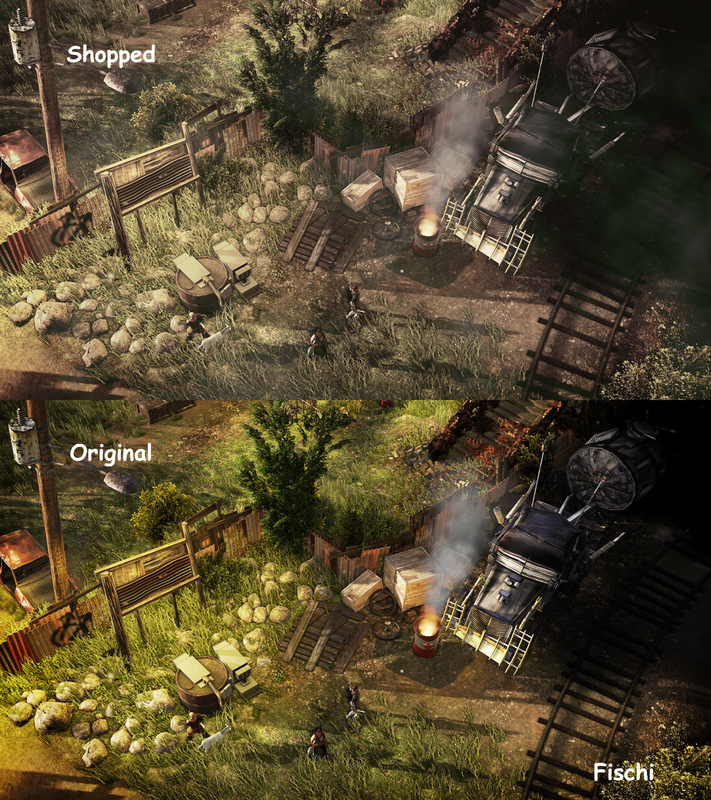 Hopefully this was only done to amplify the improvements in graphics, and the actual game will be less cartoonish. FischiPiSti wrote: Is it just me, or are the screenshots a bit too saturated? I like their screenshot much more. Your photoshot is terrible and unrealistic. All green looks like it is dying or dead. I am very much looking forward to the revised game, and everything that it will include. I assume that this means that there won't be any more patches between now and the release of the GotY edition, correct? Quite possibly a record for how quickly someone called graphics "cartoonish" because they don't look like the camera has six inches of mud on the lens. Was it ever the plan for this not to be given to backers? I would be extremely surprised if that was the case. I would like it if the game is changed significantly on the saving the Ag Center play thru if you already beat it once saving High Pool.